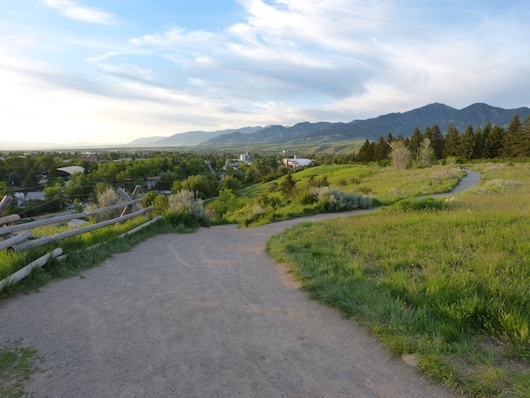 This is a good alternative to the Gallagator Trail and an opportunity to get that heart rate up with some hill running right near downtown Bozeman. The Bozeman Trail comes off the Gallagator Trail, right near the Bozeman Public Library. Do a short but steep climb/loop around Peet’s Hill, which features great views. Continue on the Bozeman Trail south, paralleling S. Church St. where you’ll take a LEFT at the ~1 mile mark, crossing Kenyon Dr. Follow the trail east, making a loop of the so-called Holly Cherry, following the trail clockwise. For the return, follow the Bozeman Trail, which involves a ~1/2 mile section along Kagy Blvd. & Sourdough Rd. An alternative is to follow the pedestrian path along Highland Blvd. Additional Options. There are numerous other trails in the area. The Highland Glen Trail comes off the easternmost part of the Bozeman Trail. The Painted Hills Trail runs south of Kagy Blvd. The popular Gallagator Trail heads south toward the Museum of the Rockies. Near Bozeman Public Library. Also access points off S. Church St.